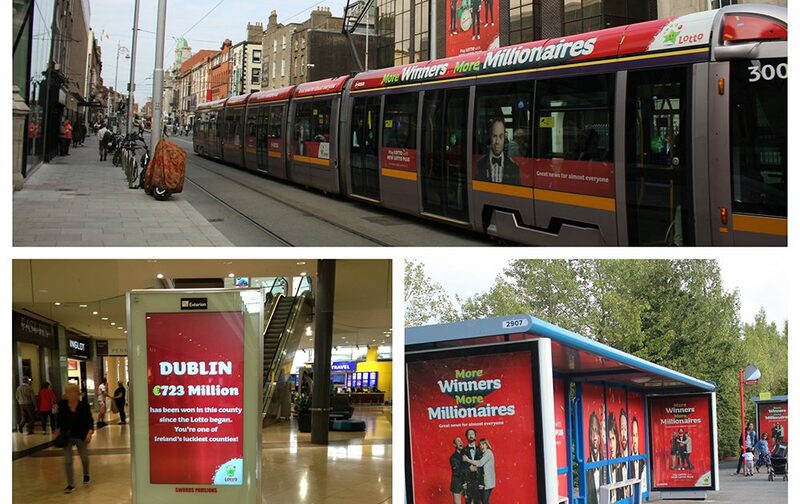 As part of its nationwide campaign to promote the new Lotto Plus game, the National Lottery is running an ambitious and innovative multi-channel OOH campaign that is fueled by data. Incorporating classic OOH formats alongside dynamic digital screens, the campaign seeks to build awareness of increases in prizes, winners and, of course, millionaires, with the relaunched game. The campaign also aims to connect with consumers at a local level, reminding them of the nationwide spread of winners. To achieve these goals, the Lottery joined forces with Starcom, Rothco and PML Group. Classic OOH such as large format, 6 Sheets and transport delivered coverage and heightened awareness. In addition, an innovative OOH spin was put on the Abbey Street LUAS stop, branding the station signage. A wrapped LUAS tram added to the sense of occasion. In addition, Adbikes and a building banner enhanced the interest and excitement around Lottery HQ on the day of launch. Five Adshel vinyl wraps also complemented the campaign.